The SY58013U is a 2.5/3.3V precision, high-speed, fully differential 1:2 LVPECL fanout buffer. Optimized to provide two identical output copies with less than 15ps of skew and only 55fsRMS of phase jitter, the SY58013U can process clock signals as fast as 6GHz, or data patterns up to 10.7Gbps.The differential input includes Micrel's unique 3-pin input termination architecture that interfaces to LVPECL, LVDS, and CML differential signals (AC- or DC-coupled) as small as 100mV, without any level shifting or termination resistor networks in the signal path. For AC-coupled input interface applications, an on-board output reference voltage (VREF-AC) is provided to bias the VT pin. The outputs are 400mV LVPECL compatible, with extremely fast rise/fall times guaranteed to be less than 80ps.The SY58013U operates from a 2.5V ±5% supply, or 3.3V ±10% supply, and is guaranteed over the full industrial temperature range (-40°C to +85°C). For applications that require greater output swing or CML-compatible outputs, consider the SY58012 1:2 fanout buffer with 400mV CML outputs. 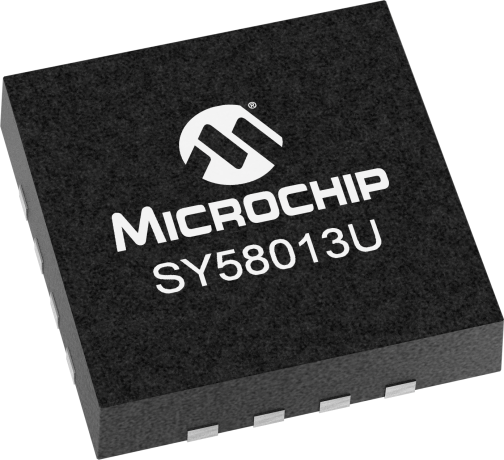 The SY58013U is part of Micrel's high-speed, Precision Edge® product line.